By: J. NORMAN STARK, ATTORNEY, ARCHITECT EMERITUS (OH) A.I.A., N.C.A.R.B. 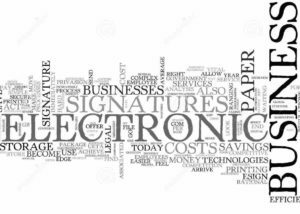 The ESIGN Act, a federal law enacted in 2000, grants legal recognition to electronic signatures and records if all parties to a contract choose to use electronic documents and to sign them electronically. The Uniform Electronic Transactions Act (UETA), an earlier enactment to ESIGN, was introduced in 1999 and has been adopted by 47 U.S. states, as well as the District of Columbia and the U.S. Virgin Islands. The UETA provides that when a law requires either a writing or a signature, an electronic record or an electronic signature can satisfy that legal requirement ONLY when the parties to the transaction have agreed to proceed electronically. The two acts provide for the use of electronic records and electronic signatures in commerce by confirming that electronic records and signatures carry the same weight and have the same legal effect as traditional paper documents and wet ink signatures. There are four major requirements for an electronic signature to be recognized as valid under U.S. law: (1) Intent to sign – Electronic signatures, like traditional wet ink signatures, are valid only if each party intended to sign. (2) Consent to do business electronically, i.e. the parties to the transaction must consent to do business electronically. Consumers must be accorded special considerations whereby electronic records may be used in transactions with consumers only when the consumer has received UETA Consumer Consent Disclosures. (3) Affirmatively agreed to use electronic records for the transaction, and has not withdrawn such consent, and (4) Association of signature with the record. Accordingly, in order to qualify as an electronic signature under ESIGN and UETA, the specific medhod used to capture the transaction electronically, must keep an associated record that reflects the process by which the signature was created, or generate a textual or graphic statement, added to the signed record, proving execution as an electronic signature. Record retention under U.S. laws require that electronic signature records be capable of retention and provide for accurate reproduction for reference by all parties or persons entitled to retain the contract or record. The asistance and guidance of a qualified Attorney is recommended in all important transactions, most paticularly with electronic signatures comitting the signer to a document ! ARCHITECT EMERITUS (OH) A.I.A., N.C.A.R.B.